The Amiga is a series of computers released by Commodore, starting in 1985. It was a very powerful and capable machine for its time, featuring a Motorola 68000 and custom chips dedicated to IO, sound, graphics and more. This family of computers became quite popular, especially in Europe, spawning a huge library of games over time. It was even used by skate companies to edit their videos. The later Amigas failed to advance vastly on the old models and the family lost its gain to newer video game consoles and other PC architectures. Eventually, Commodore became bankrupt and production of Amiga hardware and games were on the decline since. Despite this, there are still a handful of loyal Amiga users today and software continues to be developed for the classic machines, as well as a newer line of PowerPC-based Amigas released in the 2000s and beyond. The Amiga was a tremendously complex machine, with multiple revisions to both its hardware and its system software. This can make emulation quite tricky, as figuring out the requirements for any specific game can be fairly difficult. A commercial package exists, "Amiga Forever", from Cloanto, which elides past many of the complexities of Amiga emulation. It includes fully licensed ROMs, system disks, and (for applicable machines) hard drive OS images for every model that Commodore shipped. The package itself is basically a very sophisticated frontend for WinUAE and WinFellow but comes with pre-configured setups for many games. If you have sufficient expertise, you can manually do everything it's doing, but it's pretty convenient even for experts. It's also the easiest way to get legal copies of the original system ROMs. The Amiga 1000 was released on July 23, 1985 for $1,285. It had a Motorola 68000 at 7.16 MHz with 256KB of RAM. The Amiga 2000 was released in March of 1987 for $1,495. It the same CPU as the 1000 but 1MB of RAM. The Amiga 500 was released in April of 1987 for $699. It has the same CPU as the 1000 and 2000 but with 512KB of RAM. The Amiga 2500 was released as a marketing name for the Amiga 2000 with a Motorola 68020 or 68030 CPU. The Amiga 1500 was the Amiga 2000 for the UK market and was released in 1990 for £999. The Commodore CDTV was a Amiga 500 but for the console market. It was released in March of 1991 and retailed for $999. The Amiga 3000 was released in June of 1990 and retailed for $3,379. It had a Motorola 68030 at 16 MHz but it could be upgraded to 25 MHz. It had 2MB of RAM. 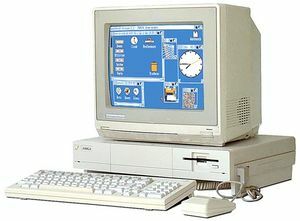 The Amiga 3000T was released in 1991 and just a 3000 but with a tower case. Hence the T in the name. It retailed for $4,498. The Amiga 3000UX was released in 1990 and was just the 3000 but with the new Amiga Unix. The Amiga 500+ was released in 1991 and retailed for $465.84. It had the same CPU as 1000, 2000, and 500. It had 1MB of RAM. The Amiga 600 was released in March of 1992 and retailed for $500. It had the same specs as the 500+. The Amiga 4000 was released in 1992 and retailed for $3,699. Motorola 68EC030 or 68040 at 25 MHz with 2MB of RAM. The Amiga 1200 was released on October 21, 1992, for $507.93. It had a Motorola 68EC020 at 14.32 MHz with 2MB of RAM. The Amiga CD32 is an Amiga 1200-based console that came with a CD-ROM drive and was first released in September 1993. It could also be upgraded to mimic an Amiga 1200 PC by equipping it with third-party add-ons like a keyboard, floppy drive, hard drive, RAM and mouse. A hardware MPEG decompression module for playing Video CD was also released. The Amiga 4000T was released in 1994 and had a 68040 CPU at 25 MHz with 2MB of RAM. This page was last edited on 17 March 2019, at 11:27.